Representatives of Hard Rock New England, a local subsidiary of Hard Rock International, the global company vying to build a destination casino resort on the grounds of the Big E in West Springfield, recently announced plans for a first-ever two-day summer music camp. The event, in partnership with the Fender Music Foundation, is limited to the first 150 participants, ages 9 to 16, with intermediate to advanced musical interest. The camp will take place on Aug. 14 and 15 at West Springfield High School. 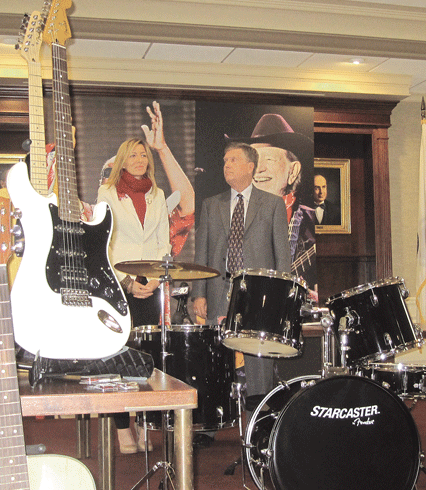 Pictured amid guitars and drum sets are Annie Balliro, senior director of brand philanthropy, and Tim Maland, president of Hard Rock Hotel & Casino New England. Maland explained that the two days will offer music classes, workshops, jam sessions, and a special open-to-the-public performance on Aug. 15 at 6 p.m., directed by Dan Lavery, a two-time Grammy nominee and a past performer with the bands Tonic and The Fray. Proceeds from the $20 tuition will support music-education initiatives in West Springfield and Western Mass. In response to the massive destruction from recent tornadoes in parts of Oklahoma, Big Y World Class Markets hosted a special in-store customer and employee donation program in all Massachusetts and Connecticut stores. Including additional support from Big Y, a total of $40,000 was raised, which will be utilized by American Red Cross chapters in both Massachusetts and Connecticut in support of ongoing relief efforts in those devastated Midwest communities. 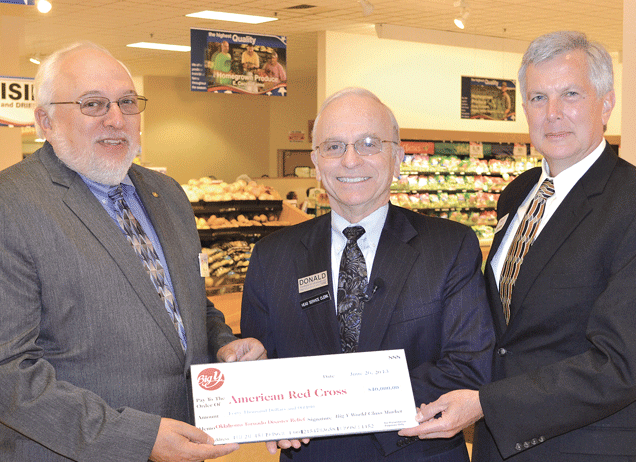 Pictured at the formal check presentation on June 26 are, from left, Rick Lee, director of the American Red Cross Pioneer Valley Chapter; Donald D’Amour, CEO of Big Y Foods; and Mark Brinkerhoff, director of Community Support for the American Red Cross Pioneer Valley Chapter.